Why do my forms fail to work on my iPhone or iPad? I have created a form, embedded it in my webpage, but it only works on my desktop computer. When viewed with my iPad and iPhone, it does not show the entire form (not surprising) but it does not allow scrolling to fill out the form, and push the "submit" button. Please help me. I understand that the forms are viewed normally and not on mobile devices. 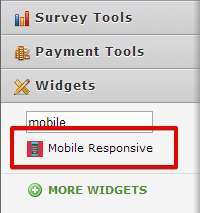 To fix this issue, we can add a widget called Mobile Responsive widget to your forms. This enables the the form to become responsive on mobile devices also.